The KWV Wine Emporium is the perfect place to experience South African wine. Situated in the Paarl Valley, the Emporium is a multi-sensory experience that will be enjoyed by most wine lovers. 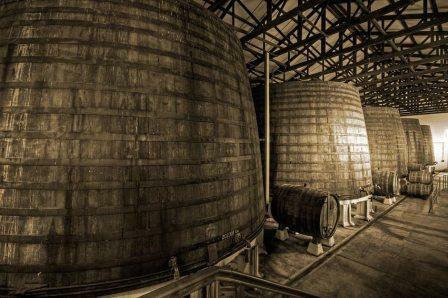 The tour starts with an audio-visual presentation of the KWV followed by a guided tour through a barrel maturation cellar and the world-renowned Cathedral Cellar. The Wine Growing Tour also begins like the conventional Cellar Tour but includes a tour of the very modern fermentation cellar. In season, you will walk through our crushing facilities, where a winemaker will give short technical discussion. 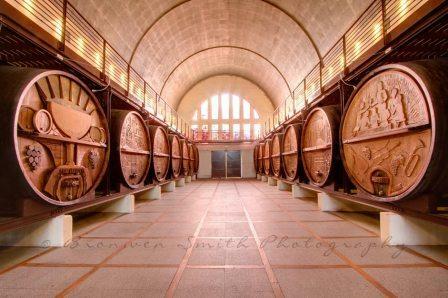 The tour will end with a formal tasting of 8 wines, including our top of the range Cathedral Cellar. NB. The Wine Growing Tour is on reservation only and for groups of 8-20 pax only. Wines for tasting do not only include the standard offering of natural red or white wines. Visitors can also experience South African Sparkling Wines, Fortified Wines, Brandies and the famous Van Der Hum Liqueur. Chocolate and Brandy tasting - Four splendid KWV brandies and four Belgian Chocolates. Biltong, Nuts and Wine Experience - By appointment for groups of 6 and more. Liqueur & Lindt chocolate tasting - Four of KWV outstanding Liqueurs with decadent Lindt Chocolates. The Wine Shop offers a selection of KWV Wines and Brandies. The range includes award winning and exclusive products, and a range of old vintage fortified wines. Gift packs and a selection of wine accessories and branded products are also available. Die Wingerdspens offers light snacks and coffee. I love the 10 year brandy. Soft and mellow!